Voting has opened for Motherwell’s Player of the Month for August – sponsored by Motorpoint. Every month, ‘Well fans have the opportunity to cast their vote for who they think has put in the best performances. Thanks to club sponsors Motorpoint, the decision is up to the fans, so cast your vote here! Midfielder Chris Cadden has been rewarded for his early season form with a deserved call-up to the Scotland U21 squad. Cadden, a mainstay in Mark McGhee’s squad for the last nine months, has kicked off the campaign in superb form, getting amongst the goals, assists and man of the match awards. Earlier in the week, McGhee had voiced his disappointment that Cadden hadn’t made Ricky Spragia’s initial squad for the qualification double head. However, the withdrawal of both Callum MacFadzean and Lewis Macleod has opened up a spot for the 19-year old, who will form part of the group that will take on both Macedonia and Ukraine in the Under 21 UEFA Championship qualifiers. Everyone at Motherwell FC would like to congratulate Chris on his call-up and wish him, and the squad, all the best over the next two weeks. Highlights from Fir Park as Motherwell and Dundee play out a goalless draw in the Ladbrokes Premiership. Images from today’s 0-0 draw with Dundee at Fir Park in the Ladbrokes Premiership. Mark McGhee was happy with some aspects of his side’s performance, but was left frustrated at the 0-0 stalemate with Dundee. The Steelmen saw lots of the ball and were on top for most of the first-half, but weren’t able to capitalise during the second forty-five and the game eventually ended up all square. And speaking to MFC TV, the ‘Well boss credited his players work rate, but bemoaned the lack of a cutting edge at times. He said: “I would’ve liked to win the game of course and I think we could have but can’t say that we should have. Generally, the manager didn’t want to focus on the negatives too and added: “I don’t think we should be too dissatisfied. There were shouts to bring on a striker but two of our main strikers are out through injury. With a weekend off for international break, the squad will strengthen with the returns of a few key players, and the manager feels the break will be used to benefit the team. Motherwell had to settle for a point and a frustrating blank in front of goal despite dominating possession for large periods. In a first half where ‘Well produced arguably some of their best football of the season the only thing that was missing was a goal or two. However, they failed to sustain that in the second half and had to survive a number of Dundee counter-attacks, but defended manfully to claim a point. Despite the last-minute loss at Ibrox last week, ‘Well boss Mark McGhee stood by the line-up which performed so well against Rangers. That meant that Scott McDonald had a pressing midfield to support him with Lionel Ainsworth and Marvin Johnson swapping flanks. The latter set himself up for the first chance dragging the ball from the right wing, across the edge of the box before firing over the cross bar. ‘Well looked confident and solid in possession during the opening exchanges and following a steady build up, Scott McDonald’s cross into the six yard box found Joe Chalmers but he scooped the ball over. Craig Clay, who was an influential figure in the ‘Well midfield, worked some space at the edge of the box before striking a ferocious drive which literally knocked Darren O’Dea to the ground. Despite being hemmed into their own half for the first 20 minutes Dundee were first to test either ‘keeper. Craig Samson did well to block Faissal El Bakhtaoui’s angled drive and as the Dens’ striker latched onto the rebound but Ben Heneghan stretched to deflect the ball. The remainder of the half, though, was played in the visitor’s half where ‘Well’s slick passing and movement had Dundee on the back foot. For all their possession the Fir Park side failed to work Scott Bain, with long range efforts from Ainsworth and McDonald flying wide and narrowly over. Just before half-time Chris Cadden’s strong running, twice got him in behind the visitor’s defence only to see Bain and then Kevin Gomis cut out his crosses as McDonald waited in the six yard box. Not surprisingly, having been second best for most of the first forty-five, Dundee looked a different proposition in the second half with a couple of early strikes from Michael Duffy whizzing past Samson’s post. Motherwell’s reply came from a McDonald shot which Bain punched away, only as far as Johnson, whose attempt to test the ‘keeper again was blocked. With 20 minutes left and the game now finely balanced El Bakhtaoui’s quick turn and shot was palmed away by Samson. Minutes later a quick exchange between Clay and Johnson set up Ainsworth but his low curling effort was gathered by Bain. Clay was again the provider when a neat one – two sent Johnson through but his finish lacked power to really test the ‘keeper. Mark McGhee made a push for the winner with James McFadden replacing Ainsworth for the final 10 minutes. The assistant manager’s first contribution was to knock the ball down for McDonald but his 20 yard shot tamely bounced into Bain’s arms to sum up ‘Well’s efforts in front of goal. It was a frustrating end to a frustrating afternoon for the hosts who will look back on not capitalising or scoring during a fairly dominant first-half with some regret. It’s all over and it’s a frustrating day for the Steelmen who were the dominant side but couldn’t get that all important goal. Johnson plays in Chalmers who can’t quite get it under control before McDonald tries one from outside the box, but Bain saves. Heneghan goes in to book after Loy ran across his path. El Bakhtaoui is warned by referee Andrew Dallas after an exchange with Tait. McDonald side-foots it to Clay, who tries to slide in Ainsworth but it’s just over-hit. Dundee go close from range. Michael Duffy tries one this time and it’s just wide. The ball drops kindly to El Bakhtaoui who runs forward, striking a low shot past the post from outside the box. Great spell for the Steelmen on the edge of the Dundee box. Lasley works it to McDonald – his curled shot is punched by Bain. Duffy tries one from the edge of the area, but it’s narrowly wide of Samson’s right post. Dundee try to work a short corner but Motherwell usher them away. Dundee win a couple of early second-half corners but the Fir Parkers defend well and clear. Motherwell have been outstanding, but just haven’t managed to make that breakthrough. It’s all Motherwell! Cadden races down the right, hits a low cross and Gomis has to turn it behind. Close for the Steelmen! Cadden cuts back for McDonald but Kerr does well to block the Aussie’s shot from close range. Johnson beats three men but his cut-back is intercepted, so nearly from the winger. Motherwell combine with around 20 passes but Ainsworth’s cross is headed away. Some great stuff from McGhee’s men. El Bakhtaoui slips it to Williams who over-hits his pass and Samson gathers it with ease. Williams squares it to El Bakhtaoui but Heneghan puts in another wonderful sliding tackle to stop the threat. Another ‘Well corner is headed goal-ward by McManus, but Bain collects it. Motherwell corner falls to Johnson in the box, but his low strike crashes into bodies in front of the goal. Chris Cadden beats Nick Ross and yet again the youngster is fouled. Chalmers stands over the free-kick but curls it over the bar. McGowan goes in to the book for a tackle on Craig Clay. McDonald goes close from range! Works the space, spins his man and strikes narrowly over from 25 yards. Ainsworth is incredibly ambitious, striking one from a full 30 yards, but it doesn’t trouble Bain. A shocking tackle from O’Hara, whose studs caught Johnson, somehow only receives a yellow. Cadden does well to win another corner, but from the set-piece Ainsworth collects on the far side and dinks a cross over. El Bakhtaoui breaks free on goal, Samson saves his first low strike and Heneghan lunges brilliantly to block the second attempt. From the corner, the referee awards a Dundee free-kick after Cadden held his man. Clay threads a lovely pass to Ainsworth, whose cross is blocked and out for a corner. Craig Clay works himself a yard on the edge of the area with some neat footwork, but his strike is blocked by the face of O’Dea. McDonald is slipped in on the right side of the box, but the linesman flags – must have been tight! Tait bursts forward, attempts the cross but it is cleared by O’Dea. Cadden is swiped to the deck after turning to surge forward. Free-kick ‘Well. Ainsworth takes it towards the by-line and nearly beats his man, but it’s out for a goal-kick. Tait battles well to thwart any danger and mops up nicely. Straight down the other end, Johnson strikes just over the bar. Fast start for the ‘Well here as Clay tries one from outside the area, but it’s blocked. Mark McGhee has named the same starting eleven against Dundee that were so unlucky to lose at Ibrox seven days ago. That means Joe Chalmers retains his place with Stevie Hammell only fit enough to take his seat amongst the substitutes. Stephen McManus and Ben Heneghan continue their partnership at the heart of the defensive with summer signing Richard Tait again at right back. Carl McHugh still hasn’t properly recovered from a head injury picked up on the opening day at Kilmarnock so the midfield three contains skipper Keith Lasley, young star Chris Cadden and the impressive Craig Clay, who ran himself into the ground against Rangers last week. Top scorer Scott McDonald leads the line in attack, supported by both Lionel Ainsworth and Marvin Johnson. James McFadden, Dom Thomas and Lee Lucas are on the substitutes bench. The club are today delighted to announce an extended partnership with the Motherwell FC Community Trust. The partnership, which will include branding on the first team shorts, will help generate regular exposure of the Community’s activities. Stadium and match-day advertising will provide a platform to launch their programmes, promote key messages and provide awareness of the Trust’s seasonal activity where developing the club’s fan base will hopefully be a bi-product. The Community Trust will be donating a quantity of match tickets for each game to young people from areas of deprivation, allowing many of them to attend a game at Fir Park for the first time, free of charge. Louis Moult, pictured, has kindly agreed to become the first Motherwell FC Community Trust Ambassador, where he will donate histime to attend some of the Trust’s activities meeting supporters and representing the club off the pitch. The aim of the Trust is to use the power of football and the brand name of Motherwell Football Club to motivate and inspire people and communities to change their lives for the better. The Trust operates across Lanarkshire and works with people and communities of all ages living within areas of multiple deprivation or those affected by issues such as poor physical and mental health, unemployment, poor attainment, low engagement with physical activity and community safety. 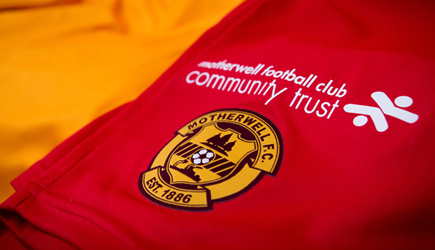 Community Trust General Manager, Dawn Middleton said: “Motherwell FC Community Trust is delighted to extend its working partnership with the club to increase the profile of the programmes which we deliver. Alan Burrows, the club’s Chief Operating Officer added: “The Community Trust do a wonderful job, touching the lives of almost 40,00 local people and working closely with them is an important step forward for all. The fourth issue of the Steelmen matchday magazine is on sale ahead of Dundee’s trip to Fir Park tomorrow. What can be found inside the 68-page programme? Along with the regular pre-match column from manager Mark McGhee and club captain Keith Lasley are new features including ‘Goal Zone’, ‘My Dream Eleven’, ‘5 Fast Facts’, ‘Picture of the Week’ and ‘Getting to Know You’ – where one of the first team stars is profiled. As part of the clubs aims to work closely with the Motherwell FC Community Trust and The ‘Well Society, there will be regular updates included in the magazine from Dawn Middleton at the Trust and Craig Hughes at the Society. This week’s main features include a look at opponents Dundee and a continuation of last season’s A-Z piece, where we arrive on the letters U and V, where Tony Vaughan and Simo Valakari are included in the insightful piece by Andy Paterson. The feature-interview is with Aussie striker Scott McDonald, who talks about the pain of Rangers last minute winner, the attitude of the squad and of course tomorrow’s opposition – Dundee. Our match reports section looks back on the Fir Parkers trip to Ibrox, in what was an excellent performance from McGhee’s side. An update on Stephen Craigan’s U20s side is included too, after the youngsters travelled north to face Inverness in the opening fixture of the Development League. As well as the latest from the Ticket Office, the magazine also has an in-depth look at tomorrow’s match-officials.